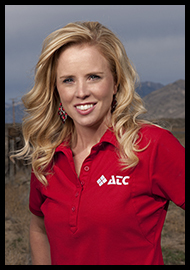 Marie has been with ATC since 2012, and works in our Arco office. Although she began as a Customer Service Rep, her true passion of working with sales and marketing soon emerged. As ATC’s “Public Promoter” Marie spends most of her days creating advertisements, maintaining ATC’s website and social media pages, and working to grow ATC’s overall public presence. She loves being an active member of her community, volunteering in various youth programs and community committees. In her free time, Marie enjoys camping and waterskiing, playing the guitar, and chasing her very active children. Her favorite snack is scones with honey butter, and she’s always on the prowl to learn something new. We’re grateful to have Marie on our ATC team!